Severe secondary mitral regurgitation (MR) affects about one of four patients with heart failure and reduced ejection fraction (HFrEF) and is associated with a twofold increase in mortality and heart failure hospitalization . Evidence-based medical and device [cardiac resynchronization (CRT)] therapy improves outcome in HFrEF patients, contributes to reverse remodeling and improvement of MR and hence is the gold-standard for treatment of secondary MR in current guidelines . Until now, evidence was lacking on whether specific treatment of secondary MR, i.e., surgical or interventional valve repair or replacement, can impact the course of HFrEF and patient outcome. Accordingly, current guidelines give only a low class of recommendation for isolated surgical or interventional treatment of secondary MR for patients who are symptomatic despite optimal HFrEF therapy [2, 3]. MITRA-FR and COAPT are the first randomized controlled trials to examine repair of secondary MR using the percutaneous MitraClip technique in patients with symptomatic HFrEF in addition to the gold-standard of guideline-directed medical and device therapy [4, 5]. In the COAPT trial, sponsored by Abbott Vascular and performed in the US and Canada, the primary endpoint of heart failure hospitalizations during 24 months was significantly decreased in favor of the intervention group with a risk reduction of 47% (95% CI 30–60%, p < 0.0001, annualized rate 35.8% per patient-year vs 67.9%). All pre-specified secondary endpoints including 24 months all-cause mortality and 12 months change of NYHA class, 6-min walking distance, quality of life, left-ventricular end-diastolic volume and MR grade ≤ + 2 were all in significant favor of the intervention group. In the French investigator initiated MITRA-FR trial, which was funded publicly and supported by Abbott Vascular, the primary combined outcome of death from any cause and heart failure hospitalization at 12 months did not differ between the intervention and control group [54.6% vs 51.3%, OR 1.16 (95% CI 0.73–1.83), p = 0.53]. Neither of the individual components of the primary endpoint nor any of the other pre-specified secondary outcomes including parameters of left-ventricular remodeling, severity of MR and measures of functional capacity such as NYHA class, 6-min walking distance and quality-of-life score EQ5D were significantly different between treatment groups. The effective regurgitant orifice area (EROA) was 31 ± 10 mm2 and 41 ± 15 mm2 in MITRA-FR and COAPT, respectively, indicating the presence of more MR in COAPT. Higher severity of MR in COAPT resulted from higher cut-offs in the AHA/ACC guidelines to define relevant secondary MR in comparison to the ESC guidelines used in MITRA-FR [3, 6]. The benefit of valve repair on survival and re-hospitalization might be pronounced and visible only when regurgitant volume and as such chronic volume overload of the left ventricle exceed certain thresholds. In support of the latter, the intervention halted adverse remodeling in COAPT, whereas left-ventricular (LV) dilatation was progressive in the control group. The lower grade MR might, in addition to differences in baseline patient characteristics and lower technical efficacy, be one explanation why LV diameters in MITRA-FR remained constant at 1 year in both the intervention and control group indicating less impact on disease progression. The LV end-diastolic volume indices (LVEDVI) were 135 ± 35 mL/m2 and 101 ± 34 mL/m2 in MITRA-FR and COAPT, respectively, indicating a progressed heart failure population with severe LV dilatation in MITRA-FR. Severely dilated LV and stage D heart failure, which were excluded in COAPT, might reflect irreversibly advanced disease and remodeling not amenable to repair approaches. For instance, in the STICH trial surgical reconstruction of the LV was also futile in patients with severely dilated LV . Furthermore, a linear dependency between the EROA and LV end-diastolic volume is proposed with respect to the resulting effective degree of MR . By inclusion of patients with 30% larger EROA and 30% lower LV volume in COAPT compared to MITRA-FR, MR severity was “disproportionately high” or “hyper-proportionate” to the degree of LV dilatation and thus particularly relevant for the progression of HFrEF disease, which might explain the pronounced prognostic benefit from valve repair. In contrast, patients in MITRA-FR showed proportionate or even “hypo-proportionate” MR when referenced to the respective LV volume, which nevertheless is severe according to European guidelines, but seems of minor or no relevance for progression of adverse remodeling (Fig. 1 ). Exclusion of patients with severe cardiac and extra-cardiac morbidity in COAPT (Table 1) might have prevented futility of valve repair with respect to outcome and functional benefit. Efficacy, safety and durability of the repair procedure in COAPT were higher than in MITRA-FR. Acute efficacy (defined as clip placement / reduction to MR ≤ 2 +) was 91% and 95%, procedural complications were 14.6% and 8.5%, and rates for MR ≤ 2 + at 12-month follow-up were 83% and 95% in MITRA-FR and COAPT, respectively (Table 1). The improved procedural outcomes in COAPT were better than in several real-world registries , which presumably affects long-term clinical outcome and symptomatic improvement. A major determinant of technical performance is operator experience next to morphological suitability. Analyses on center volumes are not available for both trials yet, but overall MitraClip experience in France was very limited due to lack of reimbursement at the time of patient enrollment. In contrast, the MitraClip was approved by the American Food and Drug Administration (FDA) in October 2013 and covered by CMS (Centers for Medicare and Medicaid Services) since August 2014. Accordingly, more than 2900 patients were treated with the MitraClip at 145 US hospitals between November 2013 and September 2015, indicating a higher experience for this complex interventional procedure . Interpretation of MITRA-FR results is impaired by missing baseline and follow-up data. Data on secondary endpoints such as 6-min walking distance and quality-of-life scores were missing in 40–50% of patients which limits statistical power. Given the lack of data on changes of heart failure medication and devices (CRT/ICD) during the trial and the lack of a central committee confirming maximal dose of guideline-directed medical therapy at trial start in MITRA-FR, effects of heart failure therapy optimization during the trial cannot be excluded which may mask effects of valve repair. In contrast, in COAPT heart failure medication and dose were assessed regularly and substantial dose increase at 1 year was reported in less than 10% of the intervention group. Findings from COAPT demonstrate for the first time that repair of severe secondary MR using percutaneous MitraClip technique can reduce mortality and halt disease progression in selected patients with HFrEF. Estimated number needed to treat to prevent one death within 5 years is lower for MitraClip therapy in COAPT (n = 6) than for established treatments such as ACE-inhibitor, β-blocker or CRT (n = 8–18) , which underlines the potential of treating secondary MR (Fig. 2). It confirms the concept that secondary MR is a causal driver of disease progression in HFrEF. 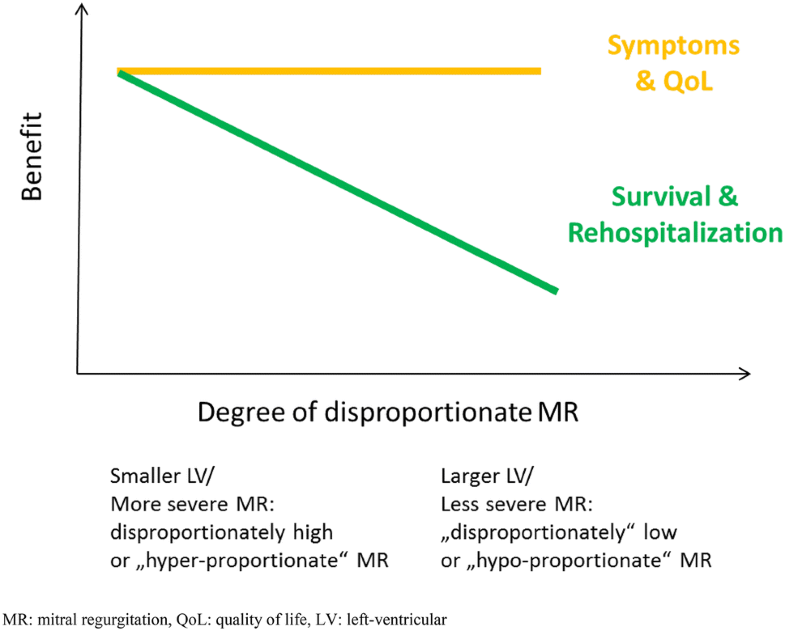 However, patient selection and maybe also procedural outcomes seem crucial determinants of the clinical and symptomatic benefit associated with percutaneous repair of secondary MR.
As discussed before, HFrEF is a progressive disease with continuous LV dilatation and remodeling. In fact, LV end-diastolic volume progressed in the COAPT control group treated with optimal medical therapy from 194 ± 76 to 211 ± 94 ml (9% increase) over a time period of only 12 months. When considering a 9% annual LVEDV increase and the above-discussed differences in baseline LV dilatation, it appears that the MITRA-FR patient population was approximately 4 years “further down the road” in their course of HFrEF. Accordingly, an earlier timing of the MitraClip procedure appears to be crucial in this patient population to gain the maximum benefits of mortality and hospitalization reductions. The question remains whether there is an indication for MitraClip therapy in “MITRA-FR like” patients with severe LV dilatation and significant MR (EROA ≥ 20mm2 according to European definitions), corresponding to a proportionate or “hypo-proportionate” MR. MITRA-FR and subgroup analyses from COAPT demonstrate that these patients might have no survival benefit or reduction in hospitalizations. 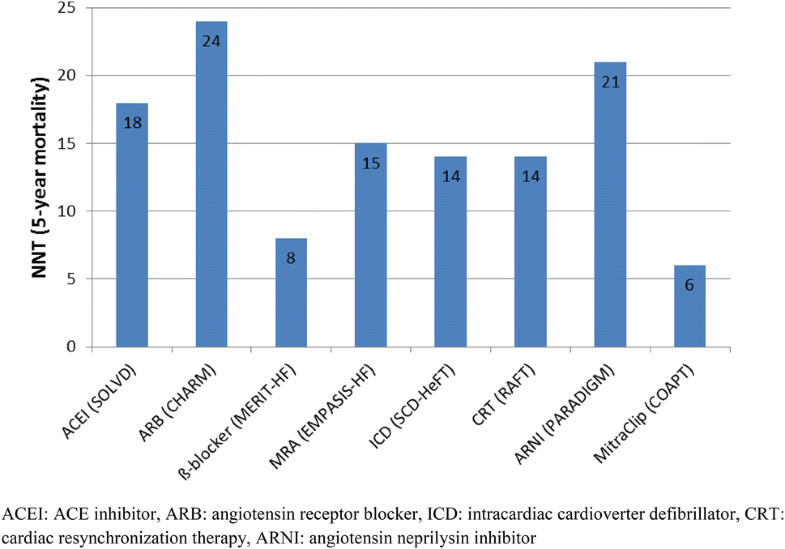 Thus, although specific clinical trials for this patient population are lacking, it appears prudent to assess first the potentials of other advanced therapies including heart transplantation or left-ventricular assist devices, which may have a particular benefit in this high-risk population. However, if such advanced therapies are not indicated or available and if the life expectancy is still beyond 1 year, MitraClip therapy may still be considered as palliative treatment in these patients due to the symptomatic improvement seen in COAPT (unpublished data) and in earlier observational studies [12, 13] (Fig. 1). Current data do not allow definite conclusions on which of the above differences between COAPT and MITRA-FR explain the diverging results. Until further analyses and ongoing trials such as RESHAPE-HF2 (NCT02444338) and MATTERHORN (NCT02371512) will give more insight, characteristics of COAPT such as the definition of disproportionately severe MR, optimized procedural outcomes and avoidance of futility should guide our clinical routine in MitraClip therapy of secondary MR to achieve similar outcome benefits. 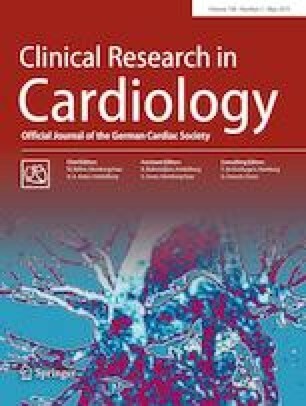 The German Society of Cardiology (DGK) provided a position statement including morphological suitability criteria for MitraClip therapy already 5 years ago, which are similar to the criteria applied in COAPT . Additionally, the very recent initiative of the DGK to certify centers for catheter-based therapy of atrioventricular valves is important to achieve high interventional expertise . Importantly, the results from COAPT using MitraClip cannot be transferred to other techniques of percutaneous or surgical mitral valve repair given differences in efficacy and safety of respective methods. Therefore, it is of utmost importance to examine alternative repair approaches in randomized controlled trials such as the ongoing MATTERHORN trial (NCT02371512) comparing surgical and percutaneous repair (with MitraClip) in secondary MR.
RP received financial support for attending symposia by Abbott Vascular. JH received speaker`s honoraria and research support from Abbott Vascular and Edwards Lifesciences. PB is proctor for Abbott Vascular and he is head of an Excellence Center of Abbott Vascular. HM received speaker`s honoraria from Edwards Lifesciences and Abbot Vascular. VR received speaker`s honoraria and unrestricted research grant from Abbott Vascular.